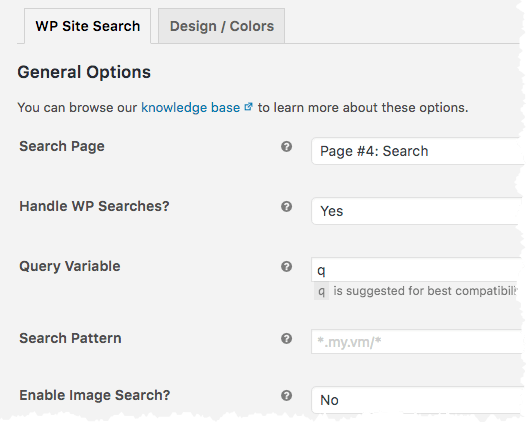 Getting started with WP Site Search is easy because it automatically creates a Page in WordPress where search queries will be handled (the Page is created with the title "Search"). All you need to do is configure a few basic options, which I'll walk through in this article. As seen in the screenshot below, all of these basic options work just fine with default values. However, I will describe what each of these do so you can tune things in further if you'd like. The variable name q is suggested for the best compatibility with WordPress, Google AdSense, AdWords, etc. However, you can name this anything you'd like. Anything other than the default variable for WordPress which is s. Please do not use s here; it's reserved for WordPress itself. While this seems like a good idea, it's really only helpful if your site is all about imagery; e.g., you are hosting a photo gallery, or have a lot of images that people are interested in as stand-alone items. Otherwise, most sites should leave this off in favor of there being a cleaner/simpler search interface when this is disabled. According to Google's TOS, you can only turn off ads if you're a registered non-profit organization. Unless you're a non-profit, you should fill this in. When ads are shown, you can earn revenue from clicks on those ads. 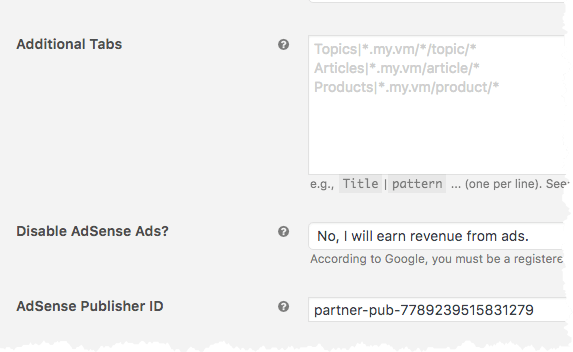 If you'd like to do this, you'll need to register for a free Google AdSense account and tell the WP Site Search plugin what your publisher ID is.